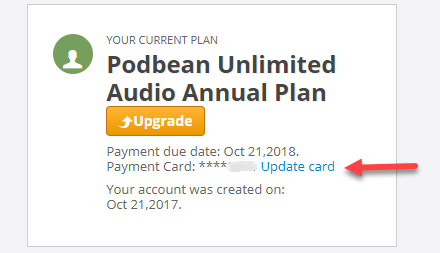 If you renew your podcast account via Stripe with credit card, it is easy to update your credit card and the payment email*. Log into your account, go to "My Account" page at the top-right corner. Click on "Update card" link. There will be a Stripe pop-up window for you to enter your email and credit card info. * The payment notification emails will be sent to your payment email address. If your subscription is in PayPal, to update the credit card in PayPal, you just need to change the primary payment method in your Paypal account. The next bill will be charged automatically to the new credit card. To change the credit card in your Paypal account, you may click the "Profile" tab after you log into your Paypal account, then click the "CreditCard/DebitCard" link in the "Financial Information" section in your Paypal profile page.